In the spirit of the emerging green economy, Guttenplan’s began its second century of operation with the introduction of eco-friendly solar energy. While “going green” has always been one of the Guttenplan’s main operating objectives we recently embarked on a “Green Guidelines” conservation program that is wide-ranging in scope. Our Green Guidelines program proves that a successful business can exist within an environmentally friendly framework. We evaluated all aspects of operations, for example paper usage, water pressure, and trucking schedules. Wherever possible, energy-saving devices and procedures have been incorporated into the manufacturing process. The changes we’ve implemented have drastically reduced our carbon footprint. Guttenplan’s is committed to exploring new opportunities to better conserve and reuse our valuable resources. To reduce our carbon footprint, we installed energy efficient LED lighting, occupancy sensors and bypass/delay timers and replaced outdated technologies with more energy efficient fixtures. Guttenplan’s purchases office equipment that is Energy Star Compliant (or has energy saving features) including computers, copy machines, and multifunction devices. To maximize efficiency, we’ve installed reflective roofing and replace HVAC filters quarterly. Every two years, Guttenplan’s conducts a thorough leak survey to identify and eliminate waste. We utilize eco-friendly refrigerant and our mechanics regularly check all seals on the freezer and cooler doors, and replace them as necessary. All freezer doors use strip curtains to minimize wasted energy. We regularly review all consumption information provided on the water bill, and compare current consumption to the prior year during the same period. All water usage is closely monitored, and we regularly check for any leaks. To minimize potential storm damage, we implemented storm water best management practices, and installed a permeable paving system/storm water reduction surface in parking lots. Our plants are drought tolerant (water conserving) and native to the area. We prepare an annual tonnage report that documents our recycling efforts and food donation programs. Our company has been removed from junk mail lists, and we use software that eliminates the need to print documents. We source, separate, and recycle electronics, equipment, cardboard, glass, metal, plastic and more. Guttenplan’s also uses eco-friendly and/or reusable packaging and pallets. In 2008, Guttenplan’s commissioned a new 110,000 watt solar electric generator to help power our production lines. 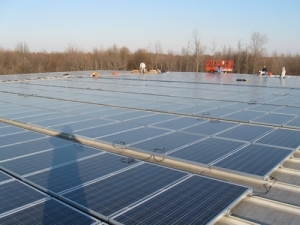 This innovation was accomplished by outfitting the freezer roof area with 649 electric solar panels. The system offsets 270 lbs of nitrogen oxide, 1,060 lbs of sulfur dioxide and 166,000 lbs of carbon dioxide annually, providing important ecological gains for the community. We use recycled products wherever possible including paper, ink cartridges, file folders, paper towels and more. Guttenplan’s regularly donates to local food banks in the area. We also donate a percentage of sales profits to non-profit, environmental organizations each year.